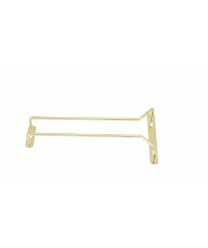 Use the Winco GH-10 Brass Plated Wire Glass Hanger, 10'' to store, display and protect stemmed bar glassware. These wire glass hangers can be quickly and easily installed under any bar shelf or cabinet, creating new storage space almost instantly. With the help of these bar glass hangers, your valuable stemware collection will stay clean, dry and safe from damage.